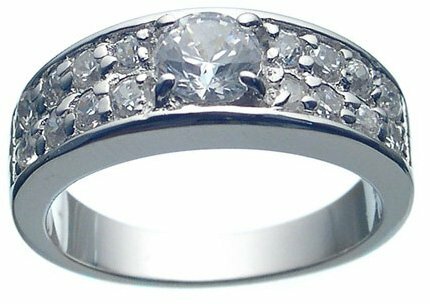 Rhodium plated jewelry metal Brilliant Wedding CZ Ring is made from base metal and Gold Plated with Rhodium and features one brilliant 5mm White Cubic Zirconia Center Stone and 16 brilliant 2mm CZ along the outside of the ring. This unusual and sophisticated design is sure to provide a unique look for the wearer. This ring weighs approximately 3 grams. Please note that the item is an extreme close-up so you can gauge its fine details, and the item may be smaller or larger than it appears.